This interesting surname, of Anglo-Saxon origin with spellings Tynsley, Tinsley, Tynsely, Tynsey, Tinsey, Tinsy and probably others, is locational. 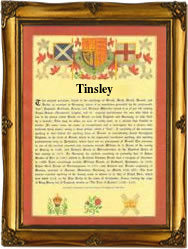 It originates from the village of Tinsley, near Rotherham in the West Riding of Yorkshire, or Tinsley in Essex. Both derive from the pre 7th century personal name "Tynni", and the word "leah" meaning an encloisure in the forest cleared for agricuture, or more literally - a farm! Tynni's farm". Locational surnames, such as this, were usually acquired either by the local lord of the manor and his descendants, or by those former inhabitants of a place who had moved to another area, and were thereafter, best identified by the name of their birthplace. The surname dates back to the late 14th Century (see below), and recordings from English Church Registers include: the marriage of Nicholas Tynsley and Joane Rice on January 25th 1588, at St. Thomas the Apostle; the marriage of Thomas Tinsley and Helena Peter on October 4th 1578, at St. Martin in the Fields, Westminster; and the christening of Johes Tynsey on April 25th 1613, at Danby in Cleveland, Yorkshire. A coat of arms associated with the name has the blazon of a chevron between three red wolves' heads erased, on a silver shield. The first recorded spelling of the family name is shown to be that of Lecia de Tyneslawe. This was dated 1372, in the Poll Tax records of Yorkshire, during the reign of King Edward 111rd, known as "The Father of the Navy", 1327 - 1377. Throughout the centuries, surnames in every country have continued to "develop" often leading to astonishing variants of the original spelling.